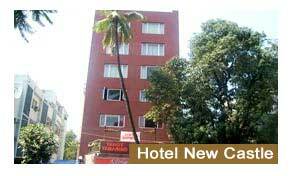 Hotel New Castle, Hotel New Castle in Maharashtra, Hotel New Castle in Mumbai. Located at a distance of just 4 kilometers from Airport, 1 kilometer from Railway Station and 2 minutes from the Bus Stand, Hotel New Castle is a renowned Budget Hotel in Mumbai. It is a popular hotel amongst the tourists as it offers a lot of facilities at a reasonable rate. Hotel New Castle consists of 24 well done up rooms divided into 17 double rooms, 4 deluxe rooms and 3 suites. Enjoy surfing channels in able television or a pretty conversation with your loved ones at home. Hotel New Castle would not let you be bored. From the attached balcony you can see endless stretch of lush land. En-suite bath with cold and hot water are a common feature here. Enjoy the diverse flavors that represent various corners of India at Hotel New Castle. The decently decorated in house restaurant is also well lighted. The serene atmosphere is conducive to a delightful dining experience. The mini bar has a wide stock of liquors. fax, shopping trips, sight seeing tour, Doctor on call, money changing, help desk, credit card, STD/ISD lines, courier services, laundry services, Internet access etc. Indiahotelandresort.com offers online information on Hotel New Castle, Mumbai and other Business Hotels in India.